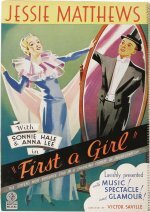 A popular hit for British screen sweetheart Jessie Matthews, this tuneful comedy plunders a German film called Viktor und Viktoria and was itself later reworked by director Blake Edwards as a vehicle for his wife Julie Andrews as Victor/Victoria. Whichever way you look at it, this is a highly unconvincing tale of cross-dressing about a girl who impersonates a female impersonator, effectively a girl impersonating a man impersonating a girl. The ramifications don't bear thinking about, but Matthews brings it all off charmingly, singing and dancing her merry way in a relatively lavish Michael Balcon production, directed by Victor Saville without so much of a hint of unsavoury subtext - at least, not to its contemporary audiences.